These roasted cinnamon maple pumpkin seeds are delicious and (mostly) nutritious – the perfect recipe to make with all your leftover pumpkin seeds! ‘Tis the season for roasted pumpkin seeds! 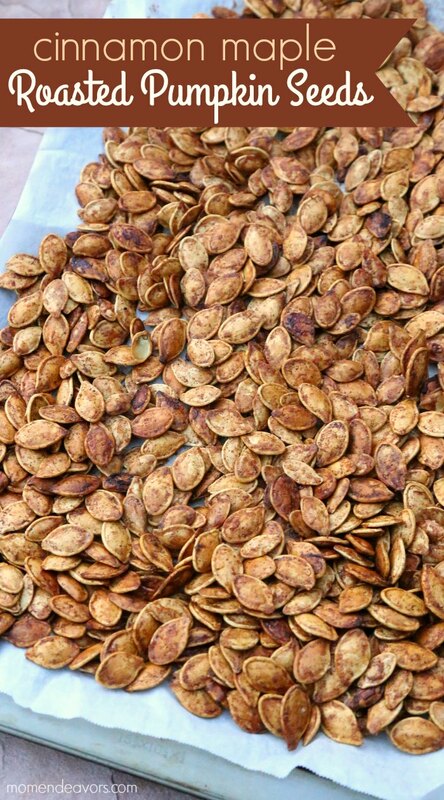 We always save the seeds from our annual Halloween pumpkin carving party just so we can make some tasty roasted pumpkin seeds. If you didn’t carve pumpkins (or didn’t save the seeds), after Halloween is often an AWESOME time to just go buy some pumpkins anyway – just for the seeds or even to make your own fresh pumpkin puree – in fact I saw pretty large ones at our grocery store today (November 2nd) priced at 3 for $1!!! Hahahah! Crazy!!! You could make A LOT of pumpkin seeds on the cheap! So if you’re looking for something sweet to munch on that is WAY better for you than all the Halloween candy you might still have sitting around, then you should give these pumpkin seeds a try! They smell absolutely phenomenal while baking! Mmmm! It’s the perfect aroma of fall with the seeds, the cinnamon, and the maple syrup. If you want them even sweeter, you can definitely add some white sugar to the mix. But we like trying to limit the refined sugar and love the hint of sweetness that the maple syrup gives! Just the right amount of sweetness, these cinnamon maple roasted pumpkin seeds are the perfect fall snack. Put the dried seeds in a bowl and pour the melted butter and the maple syrup over the seeds. Stir to coat well. In a separate small bowl mix all the spices together (Can add 2-3 Tbsp. white or brown sugar to dry spice mix if you want them sweeter). Dump the spices over the seeds and mix well. Spread the seeds onto parchment lined baking sheets and sprinkle lightly with salt. Put in 275 degree oven for 30-45 mins (or until the seeds look golden brown), stirring every 15-20 mins. After the seeds have cooled, break up with hands. Store the seeds in an airtight container at room temperature. 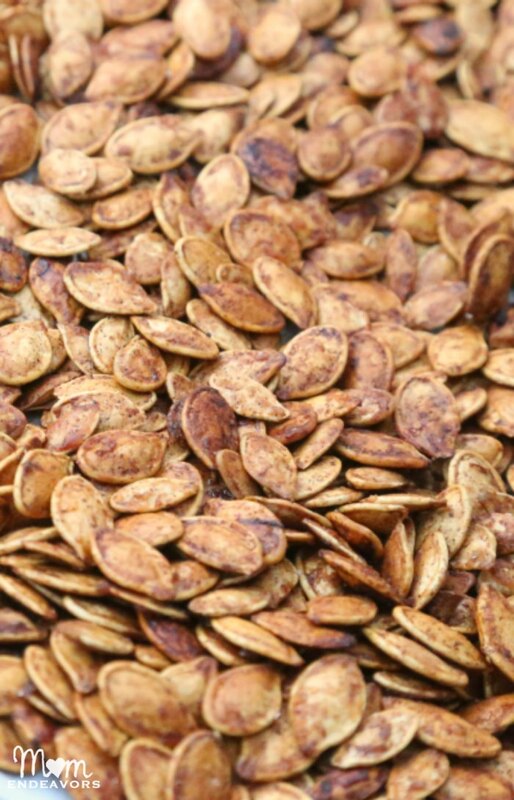 *Note – to make sure the pumpkin seeds are nice and crunchy, I highly recommend drying them out first. Separate the seeds from all the pumpkin guts & rinse the seeds. Blot dry with paper towels. Then, spread the seeds on to parchment-lined baking sheets. You can leave them out overnight to dry. Or you can also put them in a warm oven to dry for a few hours (for these, the oven was turned up to 275 & then shut off. In went the seeds, where they sat for most of the day stirring just a couple times). Once they’re dry, then start the recipe. And enjoy your sweet, crunchy, healthy snack! YUM!